Do you use a Mac as a media server? 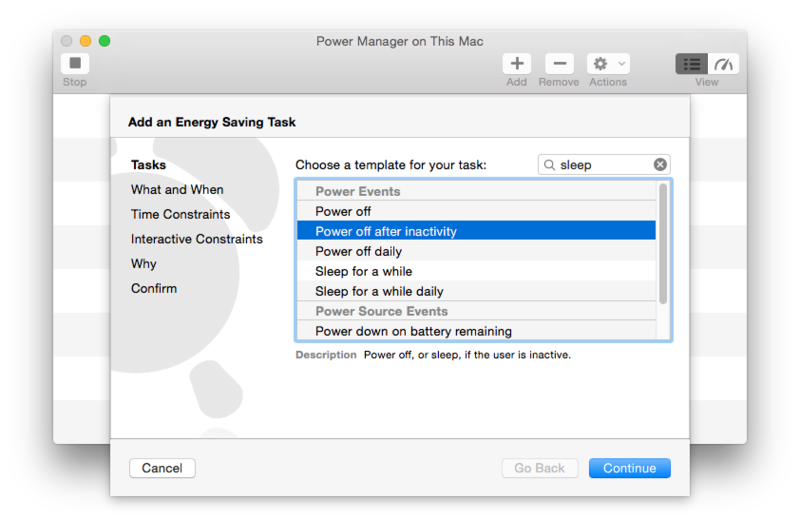 Looking for a way to save energy and have your Mac sleep more often? In this recipe, we walk through how to improve when your media server goes to sleep. We will use iTunes in this recipe but the principle is the same for other media server software such as Sonos and Plex. The first requirement, 30 minutes of inactivity, is easy to achieve. Power Manager includes an inactivity trigger that fires after a specified period of user inactivity. See How to Make Your Mac Sleep After Inactivity for a recipe to set this up. It is the second requirement, iTunes not serving, that is tricky. We need a way to determine if iTunes is actively using a media file. iTunes does support AppleScript and it is possible to ask iTunes through AppleScript if a song is playing. This seems ideal but there is a problem lurking in this approach. 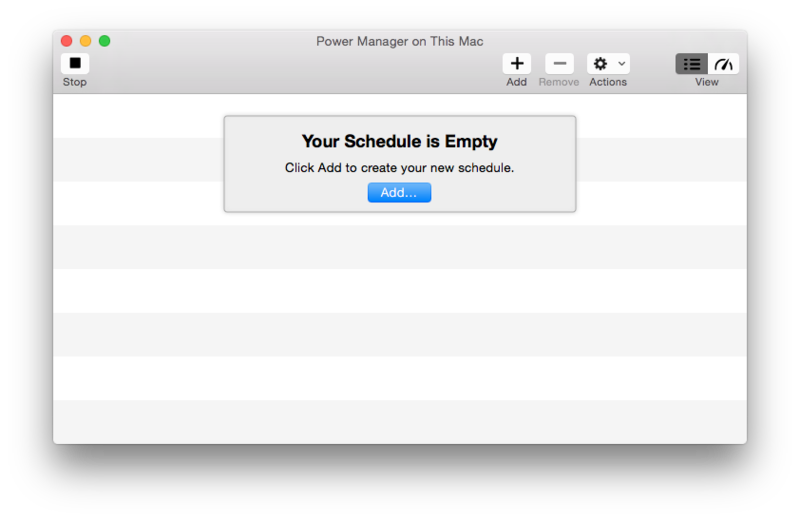 To be predictable, AppleScript must be executed within the same user session as the running application. 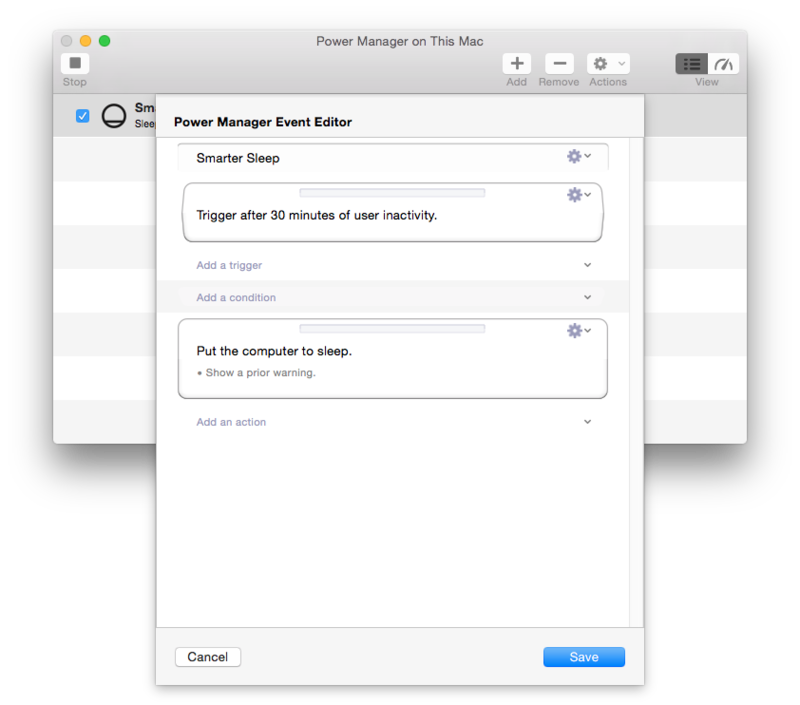 Power Manager operates as a computer wide session and not within a single user session; as of Power Manager 4.4 script conditions can not be run within user sessions. So an AppleScript approach in the user session, as a condition, is not easy to arrange. But what if AppleScript was an option? New questions quickly arise. 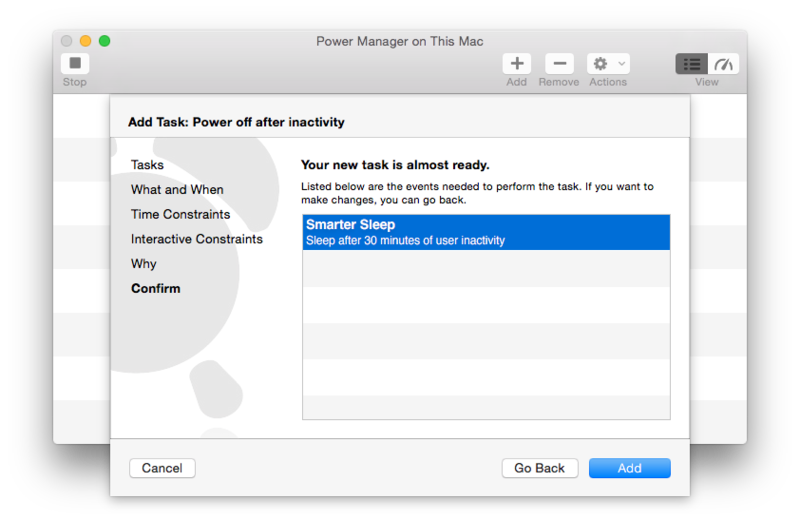 What if two users are logged into your Mac and both have iTunes running? Which instance of iTunes should be consulted – one or both? Can we tell within AppleScript who else is running iTunes and if we are the active user? The complexity of an AppleScript based approach quickly mounts! AppleScript is good but not for every situation. Let's explore an alternative approach. A more technical approach, but one that can neatly bypass many of the problems with AppleScript. What if we could see the files iTunes has open? Knowing this we could see if any of the files are media files. OS X includes lsof. This wonderful command line tool can provide exactly the information we need. lsof is an acronym of sorts for List of Open Files. The result is a sizeable list of files that iTunes.app has open. What about multiple instances of iTunes run by multiple users? Is lsof subject to the same problems as AppleScript? Thankfully not. Multiple users and copies of iTunes running is not a problem for lsof. When run as super user lsof will return the results of every instance of iTunes. When run as a normal user, only that user's instance of iTunes will be queried. The basic event is created and ready. 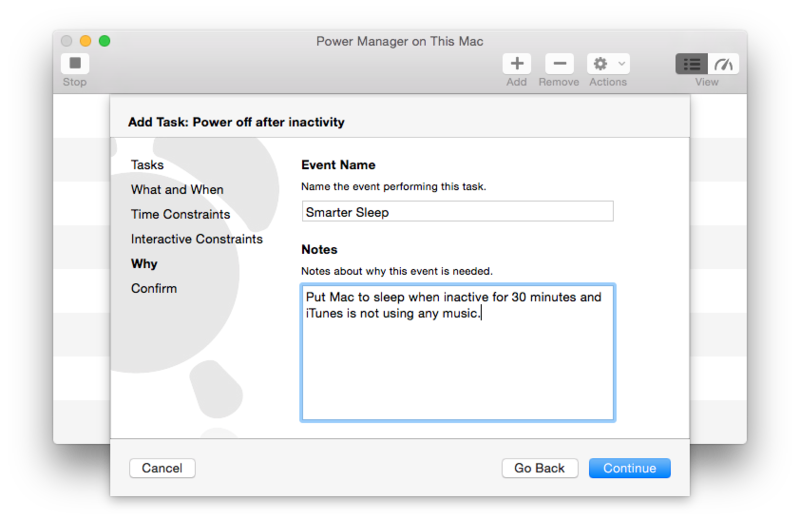 At this stage the event will put your Mac to sleep after 30 minutes of inactivity but not check for iTunes.app's activity. The event is complete. The script below is embedded within your event. This script is run each time inactivity passes 30 minutes increments. The script must pass for the event to perform the sleep. # Log messages to Console.app's "system.log" and "All Messages"
The script is written in perl because I am familiar with the language and because perl has great text matching and handling support. The script has two variables that you might want to change. The name of the process to check against and the types of files to look for. These two variables are $processNamePrefix and @mediaSuffixes. Media suffixes is a list of lowercase file extensions/suffixes. I suspect you might have media suffixes I have not heard of. So feel free to add them to @mediaSuffixes. So what does this script actually do? The script runs lsof asking for a list of all the open files matching the given process name. With the list of open files, each line is examined and checked against the provided list of media suffixes. If a file matches one of the media suffixes, a note of that file is made. When all the files have been checked, the script notes the findings in system.log and returns an appropriate exit code. 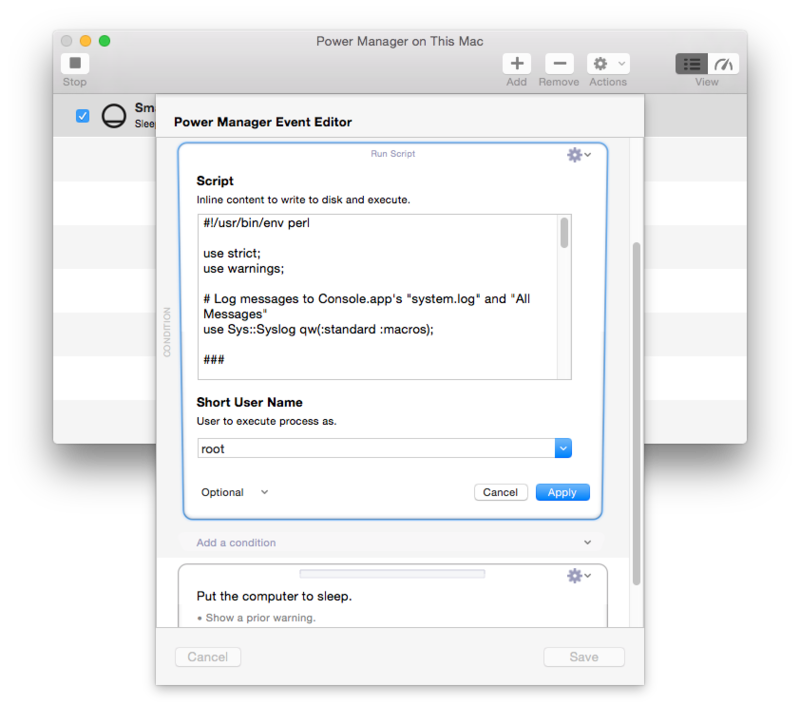 The exit code tells Power Manager if the script's condition has been met. 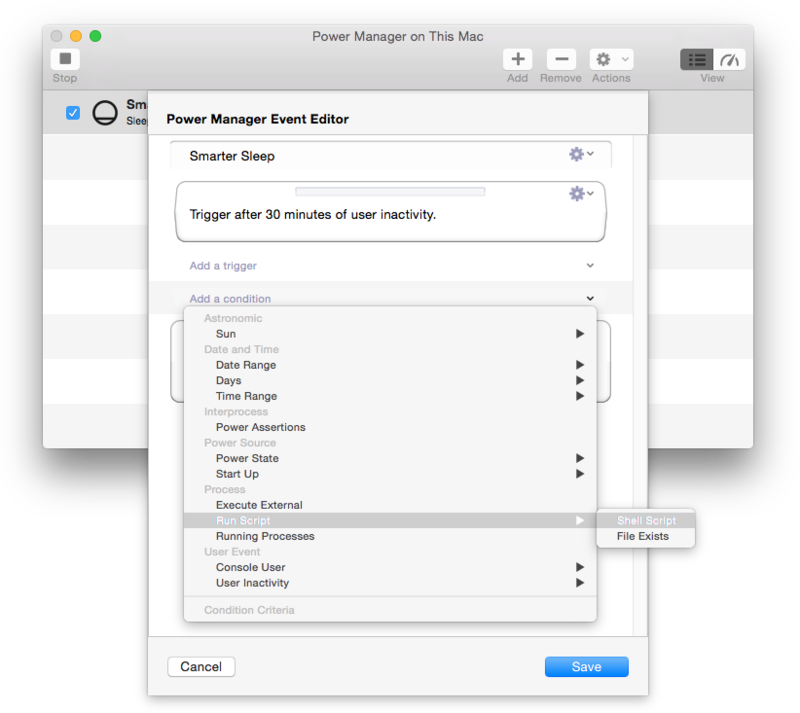 An exit code of 0 tells Power Manager to perform the event's actions. This is akin to the tradition UNIX process returning 0 to denote success. If a non-zero value is passed back to Power Manager, the script found open media files and the event's actions are not performed. It is important to test any new event. 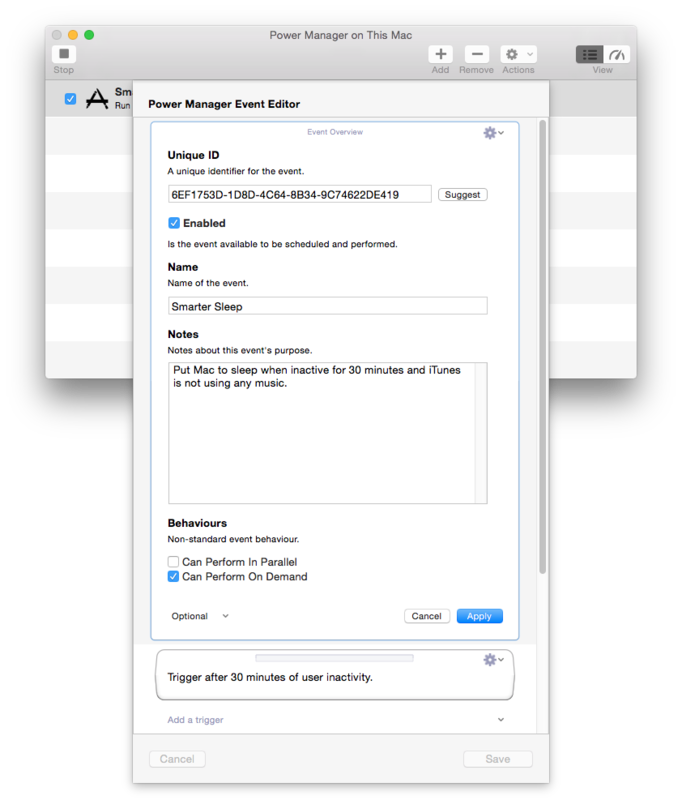 An easy way to do this by adding on-demand behaviour to your new event. 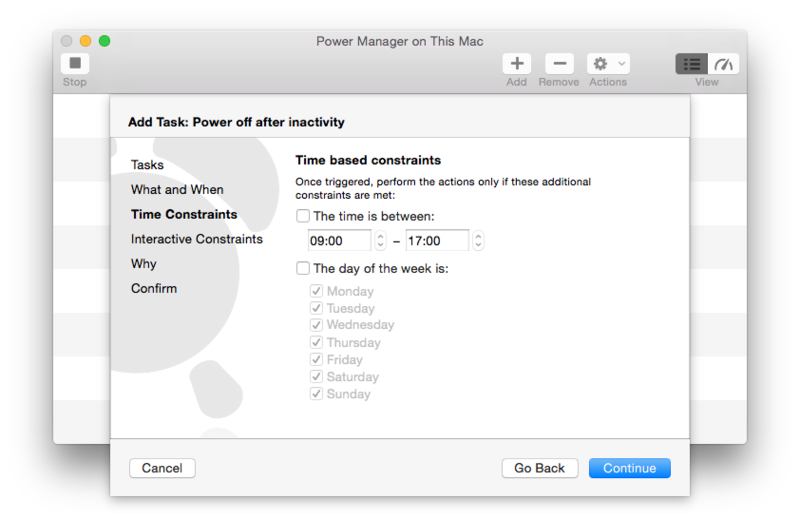 With on-demand behaviour you can manually trigger an event from the status menu bar or through the application. This avoids needing to wait for the inactivity trigger to fire. To further ease debugging and testing, the condition script records its findings to the Mac's system.log file. Each time the script is run, details of the files found will appear in the log file. Use Applications > Utilities > Console.app to view this file. 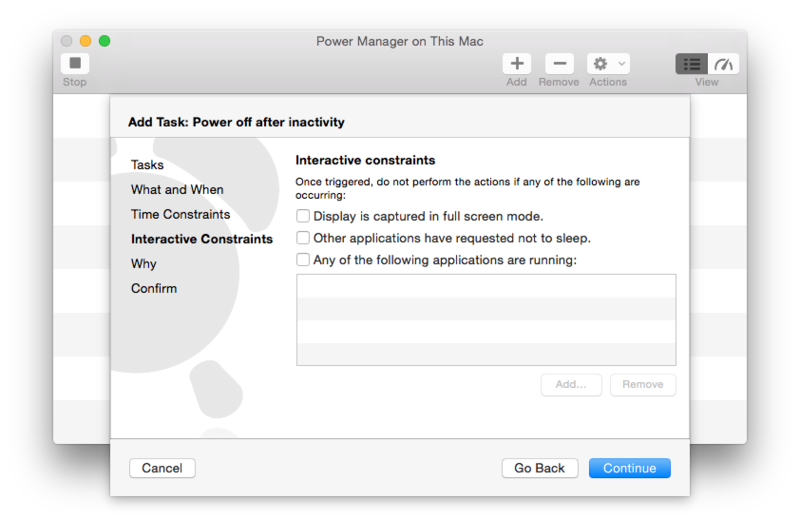 This article was posted in PM4, Power Manager, and Recipe and tagged media server, iTunes, shell script, inactivity, and lsof.